Peking ducks are, historically, domesticated animals kept as pets for human company. Training a white Peking duck is the same as training a Peking duck of any color; feather pigmentation won't affect the duck's behavior. With some dedication, Peking ducks can be fairly easily trained, and will make social, rewarding pets. Handle your Peking duck frequently. Your duck should become accustomed to human hands and associate them with something pleasant. Don't overwhelm your duck; give it time to rest between sessions of handling. Make sure you make frequent contact with it each day. This is especially important for the first six to eight weeks you own it. Feed your Peking duck treats, like chopped bits of tomato or mealworms. Soon it'll begin to associate treats with human contact and will follow you around your home. This is similar to imprinting, which is what baby ducks do in order to learn survival skills from their parents. Keep your duck in a small crate with a heat lamp for the first few weeks; this is similar to crate-training a puppy. 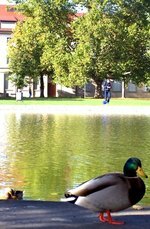 It will allow your duck to observe human activity and will facilitate frequent contact. Move your duck to a big dog kennel with food and water bowls. You can put newspapers on the bottom. Your duck will begin to recognize this as its own space, which will facilitate the training process and help it become more accustomed to you and your home. Place your duck in a supervised situation with other humans and animals. Once it has become comfortable with your touch, you can let other family members handle it. Allow your duck to socialize with family pets. Make sure you monitor these interactions closely the first several times, before letting the animals interact alone. Ducks and dogs have been known to become close.